Scripture clearly describes a God who is called the Father, Jesus Christ who is called the Son of God, and a divine Holy Spirit. The belief that these three exist as a trinity was developed centuries after the death of Christ, and has became one of mainstream Christianity’s most widely accepted doctrines. The Bible, however, reveals problems with this view which obscures the amazing purpose God has for humanity. Let’s examine the Scriptures and find out what the Bible actually says. 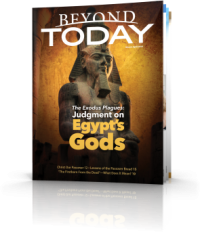 Don't delay, order your free copy of this booklet, or read it online. Even though it's one of mainstream Christianity's most widely accepted and revered doctrines, theologians admit that the Trinity is largely incomprehensible. 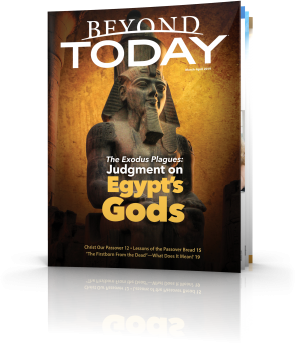 Many historians and religious scholars, some quoted in this publication, attest to the influence of Greek or Platonic philosophy in the development and acceptance of the Trinity doctrine in the fourth century. But what did such philosophy entail, and how did it come to affect the doctrine of the Trinity? 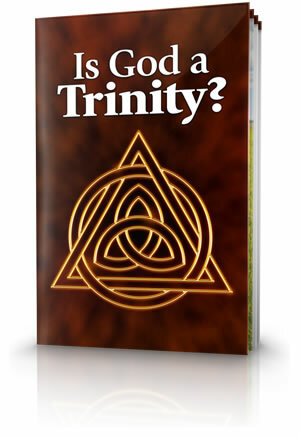 Many who believe in the Trinity are surprised, perhaps shocked, to learn that the idea of divine beings existing as trinities or triads long predated Christianity. Yet, as we will see, the evidence is abundantly documented. Some Bible translators of past centuries were so zealous to find support for their belief in the Trinity in the Scriptures that they literally added it. A case in point is 1 John 5:7-8. The preexistent Word, who later became Jesus Christ, was sent to earth by the Father in heaven. The Gospel of John bears record to this truth many times. The apostle Paul affirms that the God the Israelites of the Old Testament knew - the One they looked to as their "Rock" of strength (see Deuteronomy:32:4; Psalm:18:2) - was the One we know as Jesus Christ. The book of Hebrews speaks of the Son of God as the Being through whom God created the worlds (Hebrews:1:2) and who "sustains all things by his powerful word" (verse 3, NRSV). Only God is great enough to do such things. In addition to directly claiming in John:8:58 to be the "I AM" and having a Jewish crowd try to stone Him as a result (verse 59), as explained in this chapter, Jesus equated Himself with Yhwh of the Old Testament in other ways as well. Let's notice some of these. The apostle John opens his account of the life of Jesus Christ with this declaration: "In the beginning was the Word, and the Word was with God, and the Word was God. He was in the beginning with God. All things were made through Him, and without Him nothing was made that was made . . . And the Word became flesh and dwelt among us, and we beheld His glory, the glory as of the only begotten of the Father, full of grace and truth" (John:1:1-3, 14). "There Is One God, the Father...and One Lord, Jesus Christ"
A number of scriptural passages identify Jesus Christ as God along with God the Father. Yet some contend that the apostle Paul in 1 Corinthians 8 denied the divinity of Christ in applying the distinction God exclusively to the Father. Let's consider what Paul was actually saying here - and what he wasn't. God's Plan to "Bring Many Sons to Glory"
The Father and Jesus have, from the beginning, planned to increase Their kind. The "God kind" is a family! It is headed by the Father and now consists of the Father and the Son, Jesus Christ. Ephesians 3:14-15 mentions "the Father of our Lord Jesus Christ, from whom the whole family in heaven and earth is named." The apostle Paul, in Philippians 2, says that Jesus was willing to voluntarily surrender His awesome godly power and position for our sakes, telling us: "Your attitude should be the same as that of Christ Jesus: who, being in very nature God, did not consider equality with God something to be grasped [i.e., tightly held onto and not let go of], but made himself nothing, taking the very nature of a servant, being made in human likeness. And being found in appearance as a man, he humbled himself and became obedient to death—even death on a cross!" (Philippians 2:5-8, NIV). Scripture tells us that "the Lord our God, the Lord is one"—from which some believe three persons exist as one God. But is this really what the Bible reveals? "Hear, O Israel: The Lord our God, the Lord is one!" This simple declaration by Moses in Deuteronomy 6:4, beginning what is now commonly referred to as the Shema (pronounced sh'MAH, Hebrew for "Hear"), has caused considerable consternation to many who try to understand who and what God is. The following seven scriptures show the fallacy of claiming that the Father and the Son are one being as the Trinity teaching asserts. 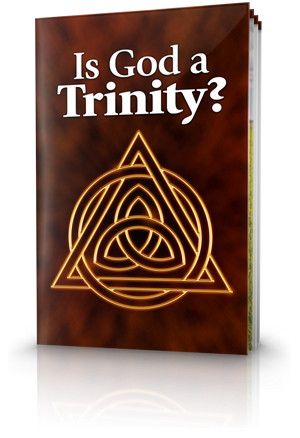 How can one reconcile belief in the Trinity with these simple questions? Throughout Scripture we come back to the reality that God has chosen to express His personal nature in terms of a family relationship. Elohim is the Hebrew word translated "God" in every passage of Genesis 1 as well as in more than 2,000 places throughout the Old Testament. Many assume the Holy Spirit is a third divine person in the Trinity, along with the Father and the Son. But a closer look at the Bible reveals problems with this view. Does Matthew 28 verse 19 Prove the Trinity? Matthew 28:19 is a biblical passage sometimes misunderstood with regard to the Trinity doctrine. Jesus is quoted as telling His disciples, "Go therefore and make disciples of all the nations, baptizing them in ['into,' Greek eis] the name of the Father and of the Son and of the Holy Spirit." Many people assume that the Holy Spirit is a divine person, like the Father and Jesus Christ, based on references to the Spirit as "he," "him" and "himself" in the New Testament. This confusion arises from two factors—the use of gender-inflected pronouns in the Greek language (a difficult concept to understand for those who speak only English) and bias on the part of some translators. What About Passages That "Prove" the Trinity? Some people, seeking to buttress their belief in the Trinity, point to a number of biblical passages that supposedly show Father, Son and Holy Spirit operating together as a Trinity. But do these passages really show that? We must be sure to read exactly what these verses do say and what they don't say, and not read into them our own mistaken assumptions. Contrary to Trinitarian teaching, Scripture reveals the Holy Spirit not as a person, but as something much different - the divine power through which God acts. The apostle Paul admonished members in one of the churches he started, "Do not quench the Spirit" (1 Thessalonians:5:19). He also urged the young evangelist Timothy: "Stir up [rekindle into flame] the gift of God which is in you through the laying on of my hands. For God has not given us a spirit of fear, but of power and of love and of a sound mind" (2 Timothy:1:6-7). In any discussion about who and what God is, we must not lose sight of the most important truth about God—that God the Father and Jesus Christ the Son are Beings of infinite love. John perfectly summarized Their divine character and nature when he wrote that "God is love" (1 John:4:8, 16). Why were you born? Do you understand why you exist? The Trinity doctrine obscures the amazing truth, clearly revealed in Scripture, of God’s purpose for you! In Genesis:1:26, God said, "Let Us make man in Our image, according to Our likeness"—the plural "Us" and "Our" denoting both God the Father and the Word who would later be born in the flesh as Jesus Christ (John:1:1-3, 14). What is meant by God's image and likeness here? Do Some Verses Deny a Divine Family? As this booklet explains, the Bible reveals that the one God is a family, presently consisting of God the Father and God the Son, Jesus Christ. And God is in the process of adding to the divine family multitudes of others - eventually all human beings who are willing and who faithfully choose to follow God's way. Scripture clearly states that there is only one God (Isaiah 46:9; Malachi 2:10; Romans 3:30; James 2:19). Nevertheless, it is evident that the one God comprises more than one Being existing together as a divine family (compare Ephesians 3:14-15 —of which the human family is a physical type or model. "I have yet to hear any theologian, any Christian, any person of any faith or of none, satisfactorily explain the Doctrine of the Trinity. There is nothing in the scriptures to back up such teachings; it makes one wonder whether the whole concept is pure nonsense." Hear oh Israel! YHWH is God! YHWH is one! That pretty well sums it up, yes? Nice article though, it builds upon this nicely. How will Israel ever come to know Yahweh embodied as Y'shua (Jesus) if we repeal them with this trinity nonsense?